Our anticipated squeeze higher in the euro vs dollar is taking longer than we expected as prices continue to consolidate in the USD1.3600 price region and with a lack of significant fundamental news this week all markets are trading in a listless manner. The rounded bottom formation now being created suggests that the squeeze higher will not be long in coming and given the number and depth of lower shadows to a series of candles in the last few weeks this adds further weight to this analysis. 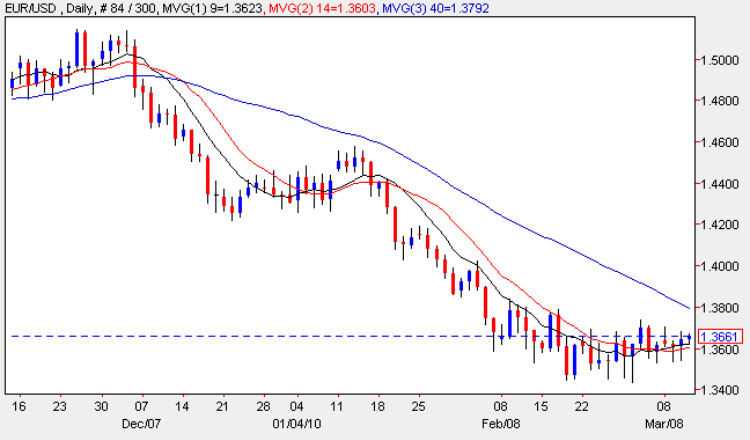 Yesterday’s candle found support from both the 9 and 14 day moving averages which suggest that the trend is now turning but for any sustained move higher we need to see a break and hold above the USD1.38 price handle which will also trigger a breach of the 40 day moving average which would add further momentum to this move. All the week’s fundamental news for the eurodollar can be found on my making break blog.